When your business requires inventory management, it is important to choose a facility you can trust to keep your product safe and secure. Having a reliable warehousing and distribution strategy in place is crucial, and at AFP Global Logistics we are able to provide much more than just space: We provide a total warehousing logistics solution. Learn more in today’s blog, below. Managing your warehousing smartly can save time and money. Will your facility be able to keep your inventory safe and secure? At AFP Global Logistics, we go above and beyond to offer the peace of mind you need. Our facility is clean and dry, fully alarmed, and equipped with a sprinkler system to protect your valuable assets. Our warehouse is conveniently located in the BWI business corridor and we take every precaution to keep your inventory safe. 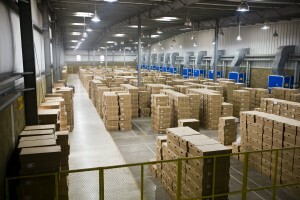 Scalability is a major concern when considering warehousing systems. On the one hand, you don’t want to pay for more space than you need, but on the other hand you want to have room to grow. Our warehousing programs are flexible and we only charge you for what you use, including space, packaging, and resources. This ensures that you don’t rent too much space or overspend on technology and manpower, but also allows you to grow as soon as you’re ready. For small and medium-sized businesses, this flexibility offers efficiency so if you are preparing for a trade show or simply need space to house your ecommerce goods, our customized programs can handle your project and budget. Whether you require kitting and assembly, order and inventory, returns management, or transportation services, AFP Global Logistics can handle it all. At AFP Global Logistics, we believe you should be able to manage your inventory from anywhere, which is why we offer inventory management software that gives you full control over your product from your own computer. The software is automatically updated each time we receive or ship products out on your behalf and you’ll also have access to customized online reporting. Our end-to-end warehouse management services allow you to focus on doing what you do best: Managing your company. For a customized warehousing experience, AFP Global Logistics is the best and only choice! We provide a full range of warehousing services, and our 25 years in the business have given us the tools we need to tailor our logistic solutions to each and every individual customer. For more information or to start designing your own logistic solutions today, get in touch with AFP at 410.590.1234 (toll-free 800.274.1237), email us at info@afplus.com, or fill out our quick and easy contact form here! This entry was posted on Thursday, February 25th, 2016	at 12:44 pm	and is filed under Warehouse Services	. You can follow any responses to this entry through the RSS 2.0	feed. Both comments and pings are currently closed.